Top the warm toasted bread with goat cheese and season with cracked black pepper. 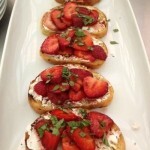 Scatter the strawberries over the cheese and spoon some of the leftover balsamic vinegar over the bruschetta. Sprinkle generously with basil leaves and cut into pieces to serve. Preheat the oven to 350. Using a stand mixer or hand mixer, combine the butter, sugar, and lemon zest in a large mixing bowl and blend on low speed until incorporated. Increase to medium speed and cream the mixture until light and fluffy in consistency – about 2 minutes. Add the eggs and blend on low speed until thoroughly incorporated, scraping the sides and bottom of bowl during the process. Stir together the lemon juice and yogurt and set aside. Add the baking powder, salt, and flour to the mixing bowl and blend on low speed until halfway incorporated. Add the yogurt mixture to the bowl and continue mixing on low speed until the wet and dry ingredients are incorporated. Remove the bowl from the mixer, scrape down the sides of bowl and pour the batter into greased pan spreading evenly. Bake for 35-45 minutes or until the center of cake is no longer wet when tested. Remove from the oven and cool completely before transferring to a serving plate. 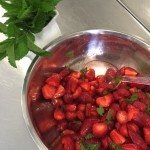 Meanwhile gently toss the cut berries with the granulated sugar and a few torn mint leaves, allowing this mixture sit for at least 15 minutes to dissolve the sugar and develop natural juices. Dust the top of the cake lightly with confectioner’s sugar and serve with fresh strawberry mixture.